Kuah is located at the south eastern edge of Langkawi and facing the water area. But there are no beaches here (except for one next to the CHOGM Park, not suitable for swimming though). Although there are several tourist attractions like the Eagle Square on the water front, you won't get any sandy stretch on the coast line here. For that, you need to visit the western and northern end of the island. Other attractions in Kuah town includes lovely parklands like Lagenda and CHOGM parks, Al Hana mosque etc. There are several Spas here that you can indulge in. The Gunung Raya Golf Course is also nearby. 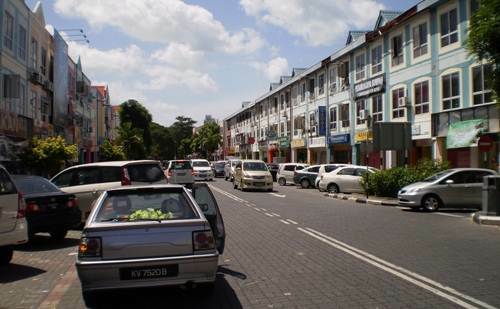 But the real attraction in Kuah is its large concentration of duty free shopping centers. Virtually everywhere in Kuah town you will find duty free shops & malls, and many different shopping complexes. Some of the major ones includes Langkawi Fair at the town center, Jetty Point complex at the Kuah Jetty, Saga Shopping Center, Coco Valley and so on. You will get shops selling virtually everything that you are looking for - electronic goods, chocolates, dress materials, souvenir & gift items, accessories, bags, sunglasses, liquour & tobacoo, ... the list is endless. All these comparatively at a cheaper price than what you get at the airport. And there are large number of hotels in Kuah both for budget and luxury travelers. Westin, one of the top five star resorts of the island is located in Kuah. Kuah also has several inns and motels for the back packers. For nightlife, the area has numerous bars and lounges that stay open till late hours. Royal Langkawi Yacht Club for example offers couple of excellent lounges like Captain's Deck and Charlie's Place on the water front.